STRONGROOM is pleased to present its first exhibition in Newburgh, NY; JULIE TREMBLAY: STRANGE ATTRACTORS. This immersive solo installation by Julie Tremblay will be the first exhibition produced by Strongroom, a newly formed 501(c)(3) organization in Newburgh, NY, and will open on May 28th at Thornwillow Institute. Julie Tremblay’s work often takes scientific theories as a starting point, exploring the complicated relationships between the natural and human worlds. Both research-based and instinctive, her monumental sculptures can take many forms. Twisting and flowing through space, suspended above or around you, hard edges of an accordion fold meet a bulbous curve of sculpted aluminum mesh.LED lights at times strung throughout and spray paint applied to the metallic surface create added depth and false shadows, giving the form a mysterious sense of space,which feels at once transparent and perhaps impenetrable. It is a form you might feel inclined to embrace, climb into, or even imitate. This new site-specific installation references “strange attractors,” a term used in chaos theory to describe external elements that interrupt regular patterns in nature. The interference causes the pattern to change and become seemingly chaotic. Walking through and around the strange forms, there are familiar yet abstract sounds from nearby Julie’s Newburgh studio - a freight train and the waves of the Hudson River, alternating between nature and the manmade. 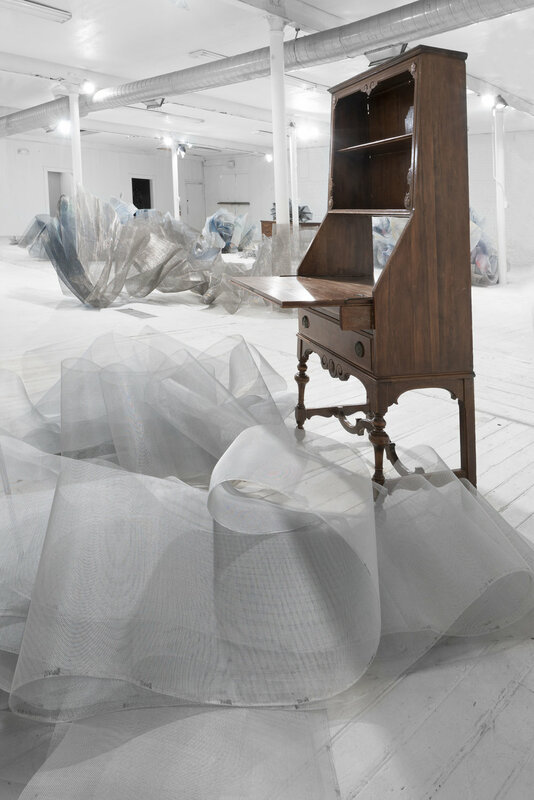 Balance and disruption are at the heart of Julie’s practice, and this immersive sculptural installation expresses a potential for transformation through its movement and meandering forms. Working with different types of mesh for over fifteen years, Julie’s formal treatment of the medium has evolved into a physical interpretation of the interconnectivity of nature’s infinite complexities. Made possible with the support of Thornwillow Institute.